It’s taken some doing, with a few casting shake-ups and a switch in directors, bl Smith Meets Love, Time and Death in New Movie ‘Collateral Beauty’ut Collateral Beauty looks to be ready to hit theaters this December 16th. The melodrama, directed by The Devil Wears Prada helmer David Frankel, stars Will Smith alongside Keira Knightley, Helen Mirren, Edward Norton, and many more! Today, Warner Bros. has blessed us with the first trailer for the film. The New Line film follows a New York advertising executive (Smith) who experiences a personal tragedy when his colleagues try to come up with a plan to get him out of his depression. Their plan works, but in a different way than they imagined. There looks to be an uneasy balance being struck in the movie, between the real-life tragedy that Smith’s character is suffering through and the fantastical twist that leads him to meet up with the personifications of Time, Love, and Death (Jacob Latimore, Knightley, and Mirren). Frankel may very well find some substantial material in this conceit but right now, the movie looks like one of those tiny, vaguely spiritual inspirational melodramas that favors the sentimentalism that we love and often need. Of course, we’re over three months away from seeing what Collateral Beauty actually is, and Frankel is known for sneaking in several moments of curiosity and fascinating ideas into his studio comedies and melodramas. For now, you can check out the full Collateral Beauty trailer below. 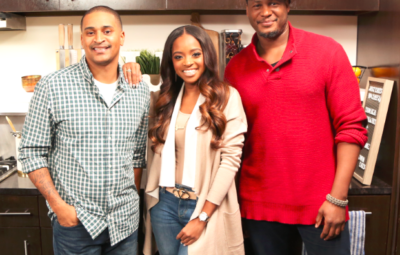 JUST EATS WITH CHEF JJ WELCOMES ACTIVIST TAMIKA MALLORY AND MIXOLOGIST KARL FANZ, AND MORE!